A lighting kit is composed by a ballast, a lamp and a reflector. 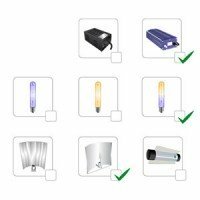 In this section you may find different types of lighting kits available, depending on the reflector chosen. Lighting kits that go from simple 150w, with estuco reflector, to profesional lighting kits with adjustable reflector. In this section you may find lighting kits classified by tipe of reflector: Lighting kits with simple reflector: The simplest and cheapest ones. Lighting kits with adjustable reflector: Reflectors with an increased reflection to improve yields. Lighting kits with cooled reflector: Reflectors with improved efficiency to extract heat. Here you will find lighting kits of 150w, 250w, 400w, 600w or 1000w, for growth.Kits de iluminación con reflector regulable: Reflectores con mayor reflexión para incrementar rendimientos. Kits de iluminación con reflector ventilado: Reflectores con mayor eficiencia para extraer el calor. 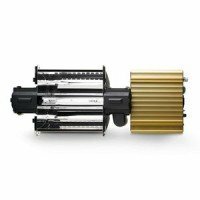 Aquí encontrarás equipos de iluminación de 150w, 250w, 400w, 600w y hasta 1000w, para crecimiento, para floración y mixtos (crecimiento y floración). The Vanguard 600w light, is a complete grow-light kit for the lowest price possible. 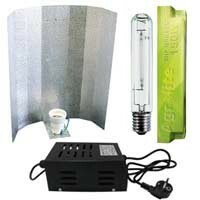 This set of ballast, reflector and mixed spectrum bulb, is the cheapest choice, for those growers with lowest budget who pretend begining its first attempt to growing indoors. The Vanguard 600w HPS kit offers a good performance, and thanks to its mixed spectrum bulb you can grow the whole cycle with just one bulb. Dimlux Expert Series 1000w DE EL UHF is one of the most powerful fixtures, and probably the most efficient in market. 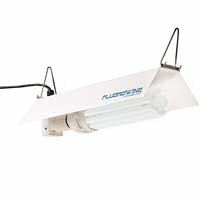 The Dimlux 1000w DE EL UHF is a complete light fixture with Double Ended Philips lamp that works at 400V, getting a complete spectrum of light, what derives in healthier plants, with increased growth ratio and larger crops. Dimlux Expert Series fixtures have 7 different dimming positions, to adapt the light performance to each plant stage. 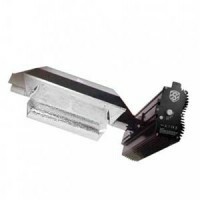 Solux Selecta II fixture is a 630w complete LEC equipment. 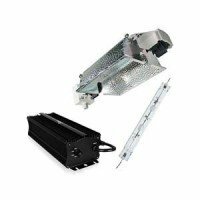 The kit Selecta II Solux 630w includes two 315w CMH lamps in the same reflector, what gives it a performance closer to a HPS 1000w fixture, in a 1,20 x 1,20 meters growing area. LEC fixtures are not only more efficient than HPS, they also produce UV light, what derives in shorter internodal space, higher flower density and resin production. Suburst CMH 315w grow light is the latest release from Hydrofarm, wich is the most modern technology for indoor growers. 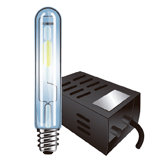 CMH letters explain the Ceramic Metal Halide technology used in it. 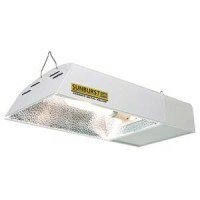 Suburst 315w CMH is a complete grow-kit including a ballast, reflector and lamp in a compact all-in-one compound. 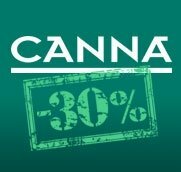 The best advantage in CMH technology is in its lower consumption, almost reaching 600w HPS performance for half the watts used. 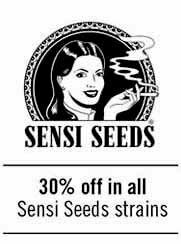 Free configuration lighting kit for growth is SantYerbasi's most elastic option so all growers will be able to set up the lighting kit that best fits in their gardens. The free customized lighting kit offers the possibility of choosing between a 250w, 400w, 600w or 1000w grow light equipment, and also the reflector type, and the ballast technology for the lighting equipment. 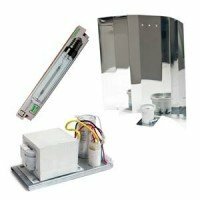 We this free configuration grow light kit you'll be able to choose type of ballast (magnetic or digital), type of bulb (to grow, flower, or mixed), and type of reflector (basic, adjustable or cooled). Hydrofarm's Fluorowing grow light kit is perfect to give plants a vegetative growth for a low electric cost of only 150w.